Looking for a cool summer sewing project – this looks amazing. A friend from church brought in an adorable origami bag that her Red Hat Ladies had made at a recent gathering. I thought it was so cute that I searched the internet until I found a pattern. I found this on the All Free Sewing website (by jembellish.blogspot.com). It is a simple sewing project, does not take much time and would be perfect for beginners, advanced sewers, or even kids for a fun afternoon. Select two contrasting fabrics and matching ribbon. 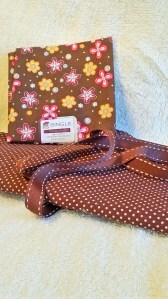 You can make this bag whatever size you want – the bigger the fabric square you start with, the bigger the bag will be. 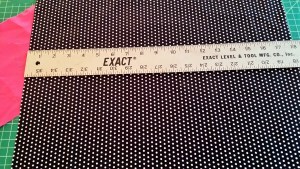 For this tutorial I selected pink and polka dot fabric squares of 18 inches each. It is important you cut you squares exactly or your bag will not come out evenly. 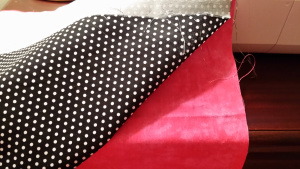 Stitch the 2 squares right sides together…..